from that point of view, isn't is bridge *from* nowhere? I like the little bushes at the end of the bridge. Nice touch! Ronnie wrote: from that point of view, isn't is bridge *from* nowhere? Not really. It has to have come from somewhere to go nowhere. Sounds very Withnail and I - "We've gone on holiday by mistake." Here's a couple of photos during and after construction. Back in my old Strathclyde Uni days we had to do a building project on the hideous Tay House stretching over Charing Cross. Turned out it's design 'concept' was based on the 'Bridge to Nowhere' (which is why it maybe looks a bit unfinished too! 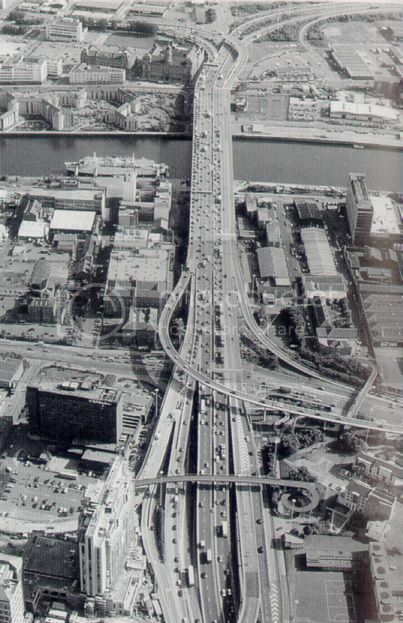 )- and the research we did, which I only fuzzily remember, is that the footbridge was supposed to loop around and join up with Argyle Street (?!). Never did. Perhaps it was a little too ambitious. Interestingly (perhaps), in Ian Banks book Espedair Street, the main character has a drunken adventure up on this bridge after drinking in the Griffin all night. The Jungle? Yeah, I do kinda miss it...but it's nice to get off the food chain, y'know? Wasn't Tay House built on a different existing bridge to nowhere ? I'm sure the one in Iain Banks book was talking about the Tay House one as the character jumps off it, and it isn't as high as this one. 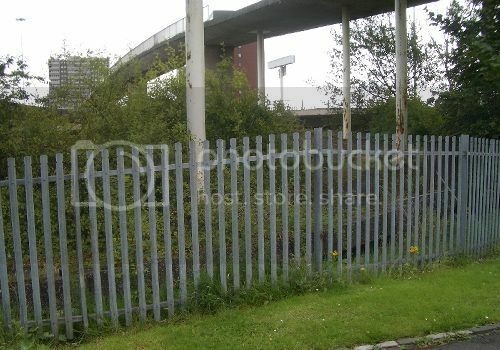 A quick search of theGlasgowStory found this other picture of this bridge from the Finnieston side. The weird thing is there are a lot more railings on it then... they've all been removed and the spiral fenced off now. I knew my memories on this were a little fuzzy. Bridge builders and their unfinished follies over the M8 unite. Tay House WAS built on a Bridge to Nowhere, but I can't find much on Google about it apart from disparaging remarks about the architecture. Proves how much attention I was paying in Uni. amcd wrote: Wasn't Tay House built on a different existing bridge to nowhere ? Thats right - it's the (now) Tay House one that is featured in Espedair St.
To build one bridge to nowhere may be considered unfortunate. Bit uninspired...but the light had gone and I was getting weary... one to do again on another day. 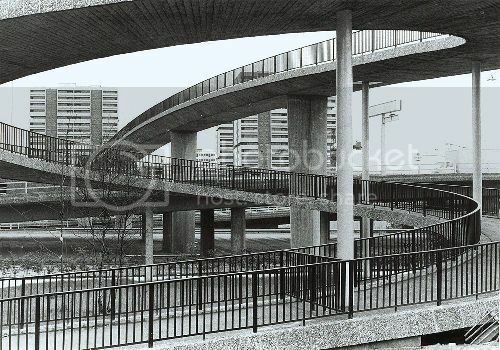 Our city fathers were such douchebags at times Theres some images on the Glasgows Inner Ring Road thread. One of my old lecturers (guy who built/designed the M77) once told me that part of the reason these bridges were never finished was the councl had to use cash from the road budget to repair the damage caused to council-owned properties during the big storm of 196ahemhhhgghh(?). 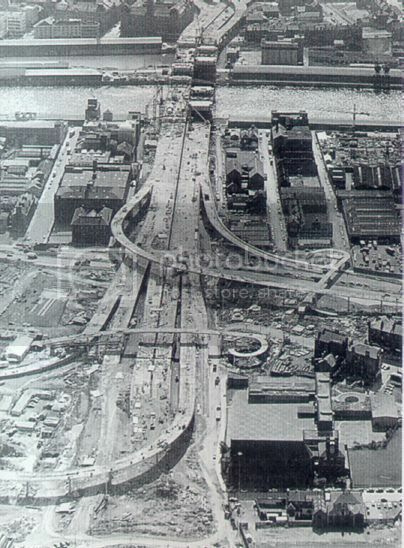 Theres an arial pic (from the arial Glasgow book) on the Tunnel thread, at the bottom of the page.